The Casio V-R7000 offers software POS features and appliance reliability. For those restaurateurs familiar with the reliability of cash registers, but are looking for the features of a restaurant software POS system, the Casio V-R7000 offers the best of both worlds. 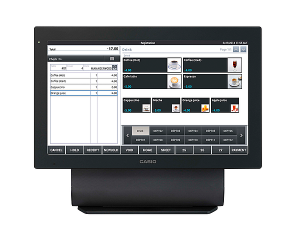 The Casio V-R7000 series touch screen POS terminal is a firmware point of sale solution highlighted by a large 15.6″ wide touch screen in a tablet style cabinet and pedestal. 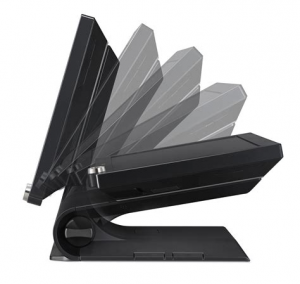 The V-R7000 and V-R7100 utilize the Android™ operating system, similar to the Casio V-R200 touch screen POS terminal. The Casio V-R7000 POS terminals are designed without any moving parts. In addition to being fanless they make use of solid state hard drives making the Casio V-R7000 series extremely reliable by eliminating common hardware problems experienced with traditional PC-based POS systems. The V-R7000 POS terminal comes embedded with the Casio Advanced Restaurant POS touch screen software application, capable of managing both table service, bar, and quick service or fast food restaurants. 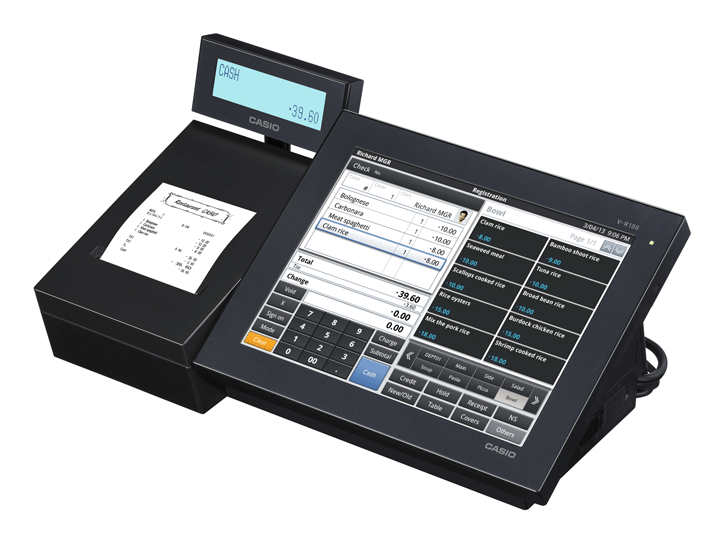 The Casio application offers features such as multiple menu screens, price levels, graphical icons on menu keys, optional and forced modifier windows, fire messages (both fixed and on the fly), kitchen printer interface, integrated credit and debit payment interface, detailed sales tracking and reporting. 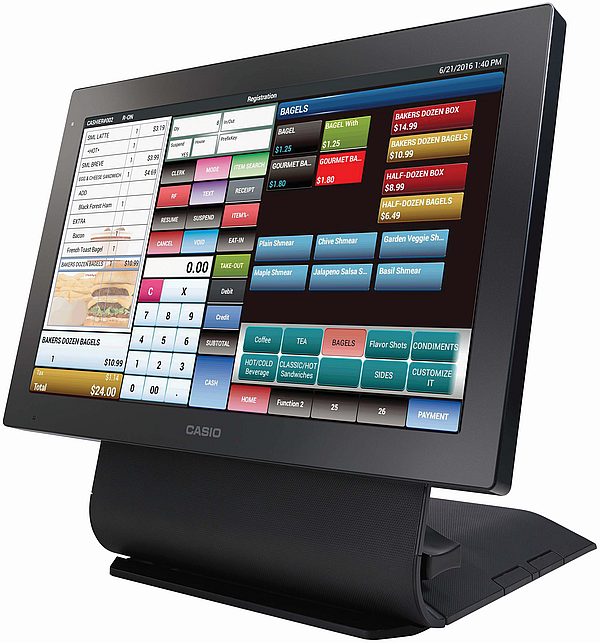 The Casio V-R7000 touch screen restaurant POS terminal also comes with a variety of hardware peripheral interfaces, including three RS-232 serial ports (expandable to six), four USB ports, one LAN, one HDMI, two cash drawer ports and two SD Card slots that provide merchants flexible connectivity options. The Casio V-R7100 touch screen model offers wifi and Bluetooth wireless communications providing restaurateurs mobility by eliminating the need for cabling and allowing the V-R7100 to be installed in areas without the possibility of wired LAN installation. Because the V-R7000 touch screen POS terminal is a firmware solution, it benefits from appliance type stability and reliability features. In the event of a power failure, the Casio V-R7000 remembers the status of the transaction and returns back to that state when power returns. Because these new Casio POS terminals are “open architecture” they are capable of running 3rd party software applications. Additional applications available on the V-R7000/7100 include grocery/convenience store, pizza, concession stand, hospitality and apparel store.